JAM3 is highly enriched in LICs and required for their self-renewal abilities. (A) mRNA levels of JAM3 in total BM cells, CMP, GMP, MPP, ST-HSCs, LT-HSCs, YFP+ leukemia cells, YFP+Mac-1+c-Kit+ LICs, and L-GMP cells was measured by quantitative RT-PCR (n = 3). (B–D) MLL-AF9+ leukemia cells were evaluated for LIC frequencies and c-Kit expression levels (MFI) in JAM3+ and JAM3– cells (n = 3; ***P < 0.001, Student’s t test). (E) Representative flow cytometric analysis of leukemia cells in the peripheral blood of recipient mice receiving transplants of WT or Jam3-null MLL-AF9+ BM cells upon the first to third transplantation. (F) Quantification data in E (n = 4–5; ***P < 0.001, 2-way ANOVA followed by Bonferroni’s post-test). PB, peripheral blood. (G–I) Survival data for recipient mice (lethally irradiated) receiving WT or Jam3-null MLL-AF9+ BM cells upon the first (G), second (H), and third transplantation (I) (n = 4–5; *P < 0.05, **P < 0.01, log-rank test). 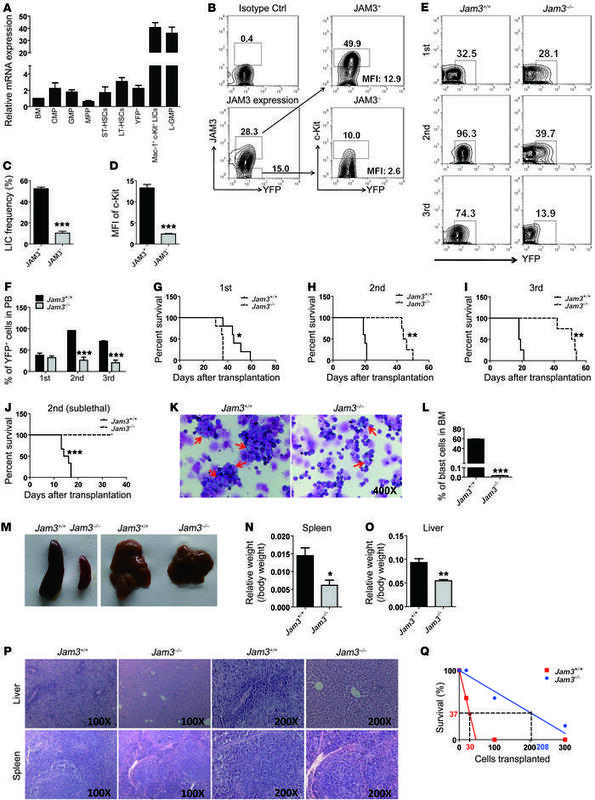 (J) Survival data for recipient mice (sublethally irradiated) receiving WT or Jam3-null leukemia cells upon the second transplantation (n = 5; ***P < 0.001, log-rank test). (K) Representative images of Giemsa-Wright staining for WT and Jam3-null MLL-AF9+ BM cells upon the second transplantation. (L) Quantification of the frequencies of blast cells in K (n = 3; ***P < 0.001, Student’s t test). (M) Representative images of the sizes of spleens and livers of recipient mice upon the second transplantation. (N and O) Quantification of the weight of spleens and livers in M (n = 4; *P < 0.05, **P < 0.01, Student’s t test). (P) Histological H&E staining of livers and spleens. (Q) Limiting dilution assays comparing the frequencies of LICs in WT and Jam3-null MLL-AF9+ BM cells. Experiments were conducted 3–5 times for validation.